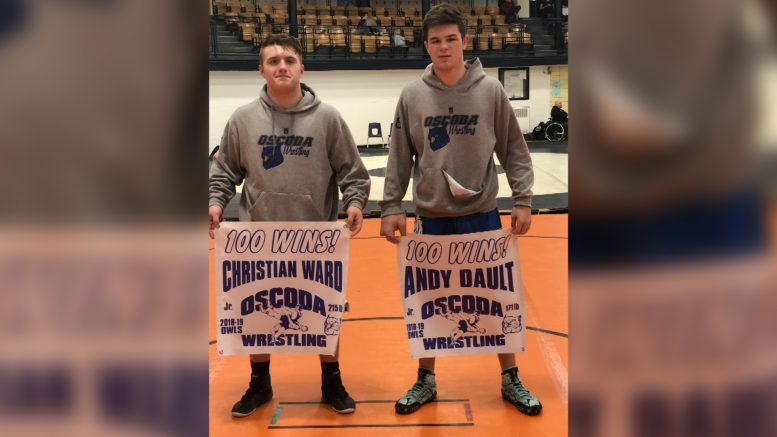 Andy Dault and Christian Ward both won their 100th wrestling match on Saturday for the Oscoda Owls. MOUNT MORRIS — “Milestone Weekend” continued Saturday in Northeast Michigan for two more high school athletes. After 3 basketball players achieved their 1000th career point, Oscoda wrestlers Andy Dault and Christian Ward both reached 100 career wins. Dault (171 pound weight class) also went 5-0 during Saturday’s team meet, while Ward (285 pound weight class) went 4-1. The two Owl juniors have been wrestling together since they were in elementary school. Dault became the 29th wrestler in Oscoda history to achieve the feat and Ward was the 30th. 100 wins is among the top feats a high school wrestler can accomplish. It is a sign of excellence for both the wrestlers and their program. Congratulations to both Andy and Christian!